← 245 "Kill the Alligator and Run"
"Last Tap Dance in Springfield"
The living room is a jungle. Marge, Lisa, Bart, and Maggie swing in on vines gracefully, like Tarzan. Homer, swings too far and crashes, like George of the Jungle. "I will not dance on anyone's grave"
Last Tap Dance in Springfield is the twentieth episode of season 11. It originally aired on May 7, 2000. The episode was written by Julie Thacker and directed by Nancy Kruse. "After seeing "Tango de la Muerto" at the local theatre, Lisa is inspired to learn the art of the dance, tutored by none other than former child actress Little Miss Vicky Valentine. Meanwhile, Homer decides to increase his visual acuity with laser eye surgery." 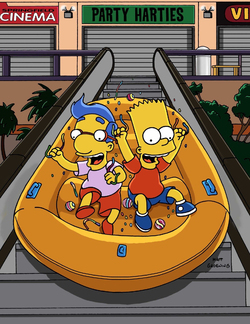 The Simpsons are visiting the mall, buying equipment for Bart's upcoming camping trip. Homer gets his eyes examined at the optometrist, while Marge and Lisa go to see Tango de La Muerte, a romantic film. Lisa is entranced by a character called "Lisabella", a plain and bookish woman who is revealed to be beautiful when she is chosen to be the lead male's dance partner. The film charms Lisa so much that she now wants to become a dancer. Homer, meanwhile, takes the laser surgery and neglects the eyedrops used to prevent crusting and as a result has his eyes crusted, so he can't see. He is later tricked by Jimbo, Dolph, and Kearney (who pretends to be Marge) into buying them cigarettes and Jack Daniels. Marge takes her to the Dance School of "Little" Vicky Valentine, a former child actor (who bears more than a passing resemblance to Shirley Temple) who made her fortune tap dancing through many movies. Lisa says that she wants to learn the Tango, but Vicky forces her into tap lessons. Bart and Milhouse are excited about their camping trip, until they are informed that Nelson will beat them up all week. They jump off the bus, and decide to go camp in the mall instead. They have a wonderful time, eating all the candy and playing with the sports goods, until Chief Wiggum is called in to catch the vandals. The chief thinks that it's a giant rat's fault, and after some failed booby traps, sets a Puma loose to catch it. The Puma finds the boys, who escape after distracting it with a ball of pink yarn. Wiggum sees the end of the yarn protruding from the Puma's mouth, and decides the case is closed, believing the rat has been eaten. Lisa is upset to learn that she simply cannot dance (even Ralph is a natural), and is relegated to "curtain puller" for the classes first dance recital. She doesn't tell her parents out of shame, but then Professor Frink appears with a solution - a couple of motors, which when attached to her shoes, will make them tap for her whenever a loud sound is made. He also reveals that his next project was transforming a ball-&-weasel toy into a deadly weapon. The show begins, and her shoes pick up the tapping of the other performers. She becomes the star, matching an envious Little Vicky tap for tap, but when the audience applauds the shoes go haywire. The truth is revealed, and after some failed reassurances, Homer and Marge suggest that Lisa become a playwright, writing a play about people coming to terms with things (and to "load it up with lots of swears" in the vein of David Mamet). However, the ball-&-weasel toy, apparently fully turned into a weapon, managed to escape from its matrix, causing Frink to warn everyone to stay back. Homer foolishly ignores Frink, thinking it was simply a harmless ferret, and ends up being electrocuted as the ending screen comes on (in a similar fashion to old movies). According to the DVD commentary, episode writer Julie Thacker came up with the story when she started enrolling her five daughters into dance classes during the summer. She noted that she didn't particularly like the teachers' methods and the other children's rude parents. Modified on April 18, 2019, at 23:52.